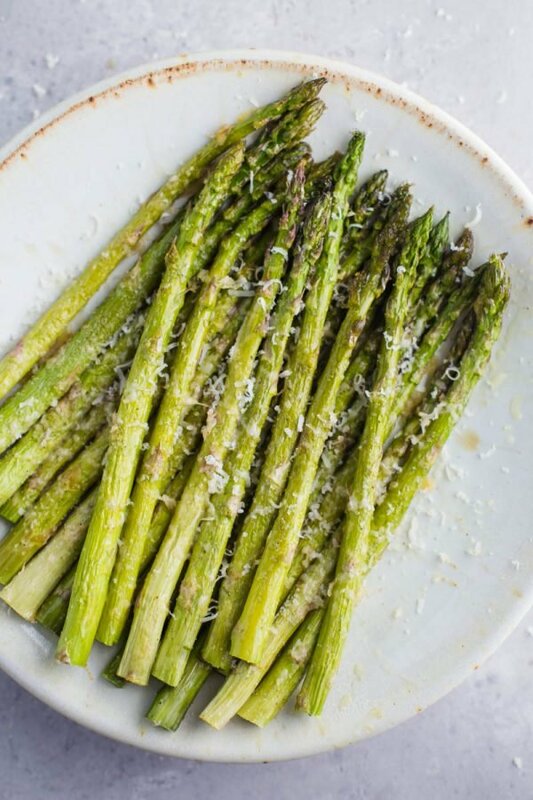 This Parmesan Baked Asparagus recipe is a quick and easy side dish that’s perfect for dinner. 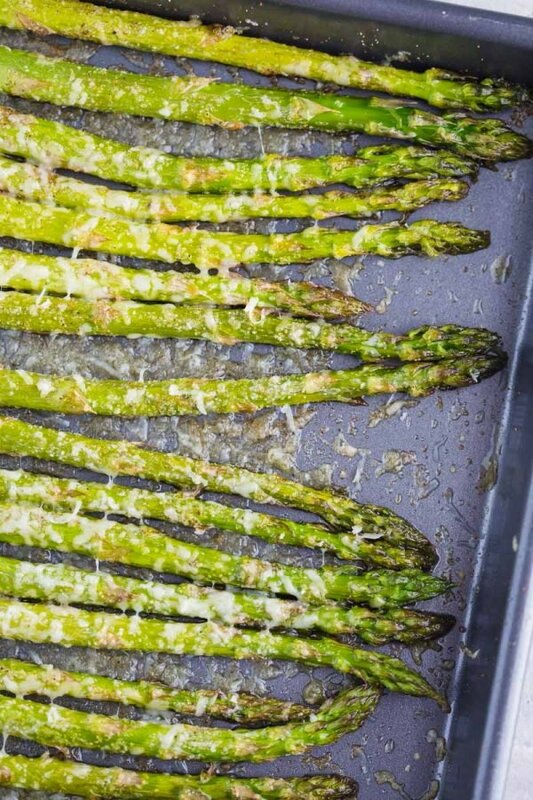 You can’t go wrong with cheesy asparagus! I’ve learned that there are 2 camps of people in the world: those that love asparagus and those that hate it. I fall into the love category but my other half falls into the hate category. Therefore, we don’t eat baked asparagus in our house very often. Since it’s currently PEAK asparagus season, I’m doing my best to get lots of roasted asparagus into our meals (even if it means that I *have* to eat all of it by myself– tough life). 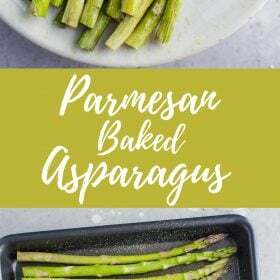 My family rented a cabin this week and this simple and easy Parmesan Baked Asparagus is DEFINITELY on the menu! (renting a cabin is really just our excuse to sit around and do nothing but cook and eat for a few days- I’m not complaining at all!). I’ve seen some recipes that call for you to shave a few layers off of the asparagus stalks. I only ever do that if the asparagus is extremely thick. Otherwise, I just chop off the woody ends and call it a day. My recipe calls for olive oil BUT you could swap that for butter or ghee (which I did the last time I made this). It’s SO rich and delicious! If using ghee or butter, simple melt it so that it’s just runny and pour it over top of the asparagus in the pan. Sprinkle with garlic salt and pepper (could also use garlic powder + salt) and pop it in the oven for 10 minutes. 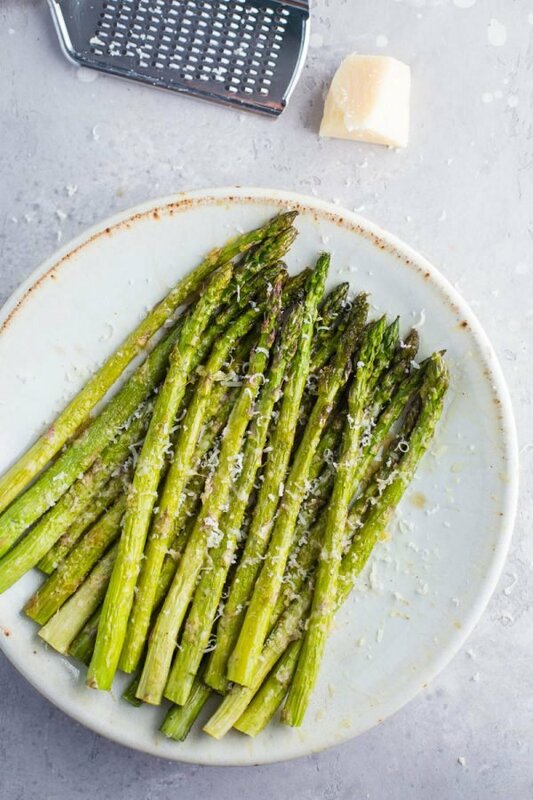 Remove and add your parmesan cheese before returning to the oven for about 5 more minutes or until the roasted asparagus is just tender. I sprinkled mine with a bit more fresh parmesan right before servings….because WHY not. I highly recommend using FRESH parmesan. It will melt into the asparagus better and just has an overall better taste. PLUS if you buy yourself a big block of aged parmesan (I like to get a really big one at Costco) it will last you for months if kept in an air-tight container in the fridge. If you search the internet for “How long to bake asparagus” you will get SO many different answers. I’ve found people that bake it at a lower temperature for 25 minutes and a larger number of people who bake it at 400+ degrees for just 8-12 minutes. I’ve tested it out a few different ways and what I’ve found is that pretty much every which way works. Asparagus is easy to bake! For my baked asparagus recipe, I set the oven to 400 degrees F and bake for about 15 minutes (give or take a couple minutes depending on how tender you like your baked asparagus and how how thick they are to begin with). 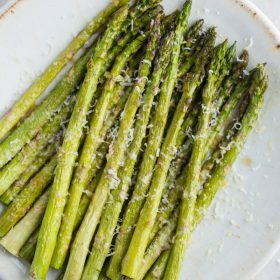 For this particular asparagus recipe, I bake it for 10 minutes before adding the parmesan cheese on top. It is then baked for another 5 minutes. 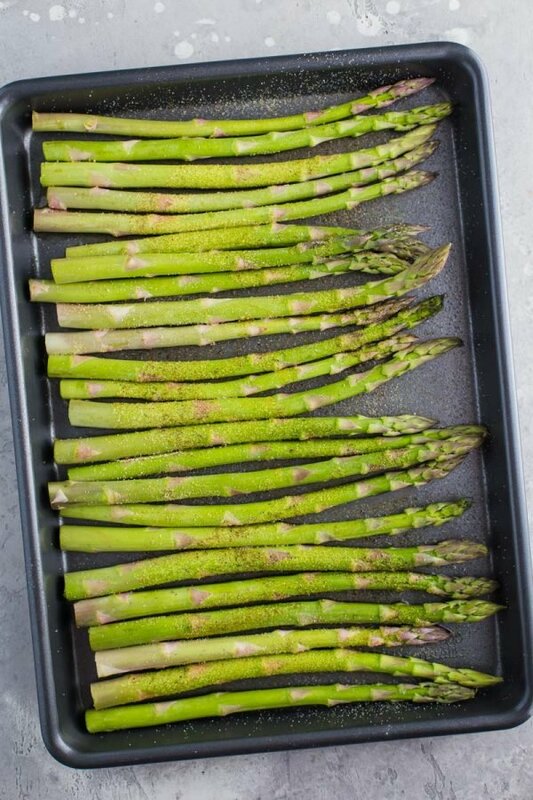 On a baking tray, line up your asparagus. Pour the oil/ butter over top and sprinkle on the garlic powder, salt and pepper. Toss to coat and rearrange the asparagus so it is in a single layer. Remove from the oven and sprinkle on the parmesan cheese. Bake an additional 5 minutes or until tender. At 77 and a widower I do my own cooking now. I never realized how much my lovely wife spent cooking fantastic meals. WELL, now I KNOW, LOTS….. The asparagus receipe I have cooked once. Phenomenal taste. I’m doing it again for dinner tonight, along with cod fish steaks. This makes me SO HAPPY to hear! I’m glad that you like it and thank you for coming back to let me know!